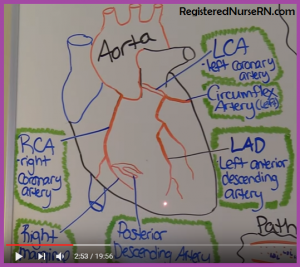 This is an NCLEX review for coronary artery disease. Patients who have coronary artery disease have developed fatty plaques due to atherosclerosis in the arteries that provide the heart muscle with a vital blood supply. CAD can lead to heart muscle damaged or death. 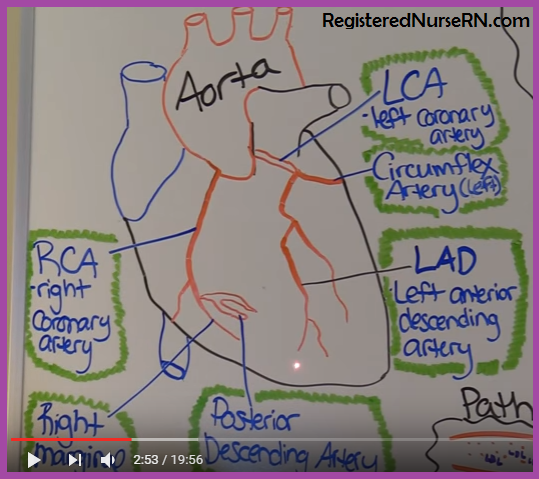 In part 2 of this series, I will cover the nursing interventions and medications used in coronary artery disease. Definition: the coronary arteries that deliver a constant supply of blood to the heart muscle begin to develop fatty plaques that can lead to restriction of blood flow to the heart. Fatty plaques are caused by a condition called ATHEROSCLEROSIS which creates fatty plaques in the artery walls. Atherosclerosis can also lead to hypertension, chest pain, and heart failure. Blood flows through the artery which contains the red blood cells and lipids (LDL). LDL (low-density lipoproteins…the bad cholesterol) starts to adhere to the artery wall and grows overtime (risks factors can increase the rate at which it grows). As it grows the patient is usually asymptomatic until the plaque becomes so big the artery starts to become narrow and blood flow to the heart becomes restricted. The patient can experience stable angina when the artery is blocked enough to slightly impede blood flow (however, blood is still able to get to the heart muscle), but the patient only has the chest pain during ACTIVITY. The activity increases the heart rate and puts strain on the heart which already has compromised blood flow, but when the activity STOPS the pain STOPS too. ****Collateral circulation can develop if chronic ischemia is experienced. This is where more than one artery forms to re-route blood to the heart muscle to make up for the decreased blood flow due to the blockage. Patients with fatty plaque buildup in the arteries are at risk for the plaques to rupture. This can lead to coronary thrombosis where clotting material aggregates at the site of rupture and this leads to a significant or complete blockage of the coronary artery. Patients will have acute coronary syndrome with unstable angina or experience a myocardial infraction. This is a medical emergency. Many patients are asymptomatic during the early phases of CAD development. Chest pain during activity (stable angina…not a medical emergency but patients need to let their doctor know about this chest pain so diagnostic testing can be performed). The pain may feel like heaviness on chest….can progress to unstable angina where the patient will have pain at rest and it is more intense…may not be relieved by Nitroglycerin. Shortness of breath: easily gets short of breath during activity because the blood supply is impeded to the heart muscle. A 24 or 48 hour Holter monitor may be ordered to watch the heart rhythm during the patient’s regular activities of daily living. 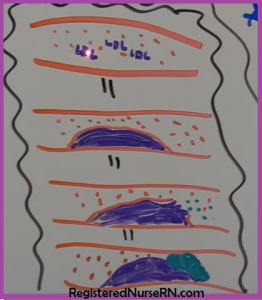 During activity, if blood flow is reduced ST segment depression will occur and patient may have chest pain and then as activity stops the ST segment will return back to normal. A patient will probably then be ordered a heart cath to assess where the potential blockage is located. Also, a nuclear stress test may be ordered. This is where a tracer is injected and pictures of the heart are taken to assess blood flow of the heart muscle during activity. Heart Cath: a special catheter is inserted into the femoral or radial artery to assess for blockages in the artery. Dye is injected into the coronary arteries to assess if they are blocked (coronary angiography)…moderate sedation is used and the patient breathes on their own. Balloon angioplasty: inflates a balloon in the blocked artery to compress the plaque against the artery wall and a stent is placed to allow blood to flow back through the artery. Sometimes, arteries cannot be stented and the patient will have to have surgery known as coronary artery bypass graft. Note: Patients with stable angina will complete a stress test to assess the need for a heart cath. The most non-invasive testing is performed first to assess the need of more invasive procedures. You may be interested in part 2. “Anatomy Of The Heart – NHLBI, NIH”. Nhlbi.nih.gov. Web. 2 Sept. 2016. “Heart Health Tests: Medlineplus”. Medlineplus.gov. Web. 2 Sept. 2016. “What Causes Coronary Heart Disease? – NHLBI, NIH”. Nhlbi.nih.gov. Web. 3 Sept. 2016.